Toyota City, Japan, April 4, 2019―Toyota Motor Corporation (Toyota) announces today that it has newly introduced SimpleFuel™*1 to its Motomachi Plant in Toyota City, Aichi Prefecture. 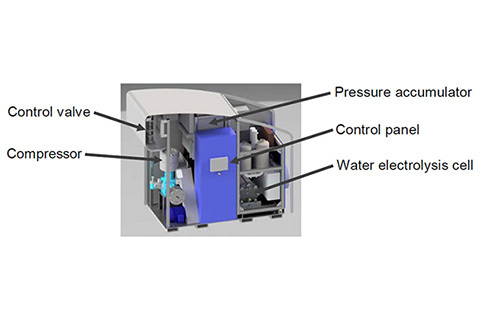 SimpleFuel™ is a small water electrolysis-based machine for hydrogen generation and filling that can produce, store, and supply hydrogen by making use of electricity generated from solar power, a renewable energy resource. To reduce CO2 emissions at its plants, Toyota intends to replace existing conventional forklifts with fuel cell forklifts. This endeavor began at Motomachi Plant, with the introduction of two Toyota Industries Corporation FC forklifts in 2017, followed by an additional twenty in 2018. This year, the Ministry of the Environment's "Subsidy for Business Costs, etc. 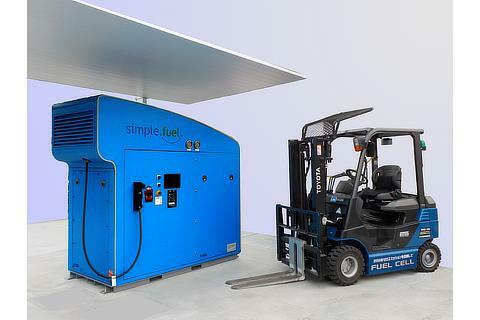 for Measures Combating Carbon Dioxide Emissions (Project to Promote Low Carbon Social Infrastructures that Utilize Renewable Energy-based Hydrogen)" makes possible the introduction of SimpleFuel™ and an additional 50 FC forklifts. SimpleFuel™ is a product of and jointly manufactured by IVYS Energy Solutions and PDC Machines in the U.S.
Data provided by TOKYO BOEKI MECHANICS Ltd. (responsible for sales in Japan).